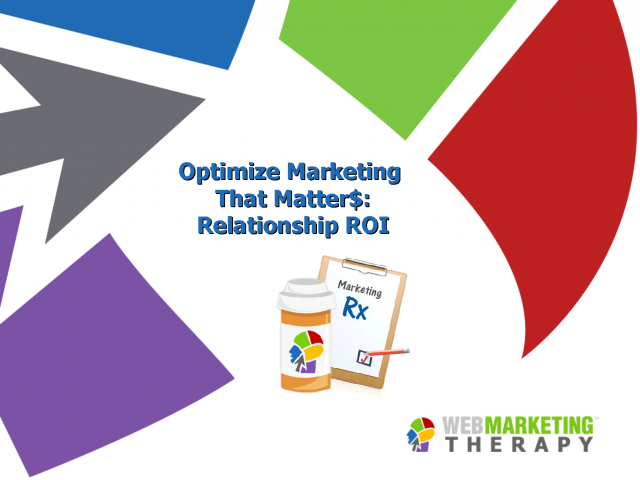 There is only meaningful measurement to your organizational bottom line – Relationship Return on Investment (ROI). The true meaning of marketing is maximizing relationships. Relationships are what sell, up-sell and re-sell products and services…keeping companies in business. Organizations need to understand the new rules of marketing to survive and thrive. In tough economic times, dollars are being watched more closely and a critical desire to track Return on Investment is on the rise - is your Relationship ROI poised for success?. The new rules of marketing (social media, web marketing, etc) make relationship development easy, if you know how and what tools to use. Tracking ROI for dollars for dollars isn’t enough. Invest in the health of your marketing and sign up for this webcast to learn the new rules of marketing and how to measure a metric that matters most to your bottom line. The power of the web to boost business is tremendous. There is no better time then now to invest in the health of your marketing and create a solid foundation to build on for long term success.